The article below was published in the daily newspaper Time News, of Twin Falls, Idaho, USA, on August 15, 1947. It contains the witness' description of his sighting of a non-earthly aircraft. Just as Magic Valley and the nation were starting to let go of lampposts after reeling under a weiter of flying saucer reports, two more Twin Falls county men revived speculation on the mystery with vivid descriptions of discs they saw. From A. C. Urie, who operates the Auger Falls Trout Farm, six miles west of Blue Lakes Ranch to Snake River Canyon, came perhaps the most detailed account of any of the fast flying objects the nation has yet produced. 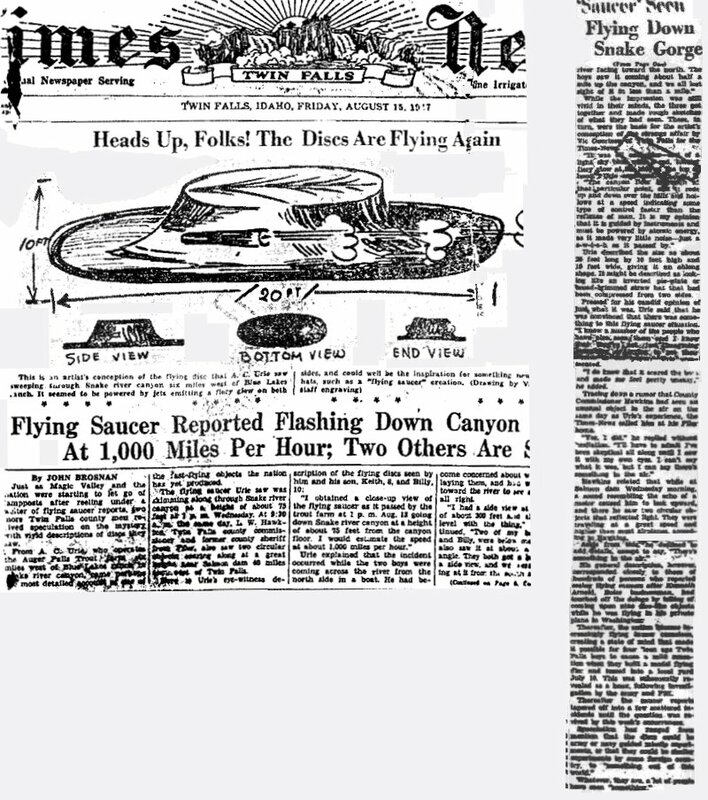 The flying saucer Urie saw was skimming along through Snake River Canyon at a height of about 75 feet at 1:00 pm Wednesday. At 9:30 am the same day, L. W. Hawkins, Twin Falls county commissioner and former county sheriff, also saw two circular objects soaring along at great speeds near Salmon Dam 40 miles south west of Twin Falls. "I obtained a close-up view of the flying saucer as it passed the trout farm at 1:00pm August 13th going down Snake River Canyon at a height of about 75 feet from the canyon floor. I would estimate the speed about a 1000 miles per hour." Urie explained that the incident occurred while the two boys were coming across the river from the north side in a boat. He had become concerned about what was delaying them, and walked toward the river to see if they were all right. "I had a side view of a distance of about 300 feet and almost was level with the thing," he continued. "Two of my boys, Keith and Billy were below me and they also saw it at about a right angle. They both a lower and a side view, and we and we were staring at it from the north side of the facing toward the north. The boys saw it coming from about a half a mile up the canyon, and we all lost site of it in less then a mile." While the the impression was still vivid in their minds, the three all got together and made rough sketches of what they had seen. These inturn were the basis of the artist conception of the strange affair by Vic Goertson of Twin Falls for the Times-News. "The canyon floor underneath at that particular point was that it rode up and down over the hills and hollows at a speed indicating some type of control faster then the reflexes of man. It is my opinion it is guided by some type of instruments and must be powered by atomic energy, as it made very little noise-just a s-w-i-s-h when it passed by." Urie described the size as about 20 feet long by 10 feet high and 10 feet wide, giving it an oblong shape. It might be described as looking at an inverted pie-plate, or broad-brimmed straw hat that been compressed from two sides. Pressed for his opinion of just what it was, he said he was convinced there was something to this "flying saucer" situation. "I know a number of people who have also seen them, and I know now that they're not just imagining seeing these things or trying to get their names in the paper. "I do know that it scared the boys, and made me feel uneasy," he added. Tracing down a rumor that county commissioner Hawkins had seen an unusual object in the air on the same day as Urie's experience, the Times-News called him at his Filer home. "Yes I did," he replied without hesitation. "I'll have to admit, I've been skeptical all along until I saw it with my own eyes. I can't say what it was, but I can say there is something in the air." 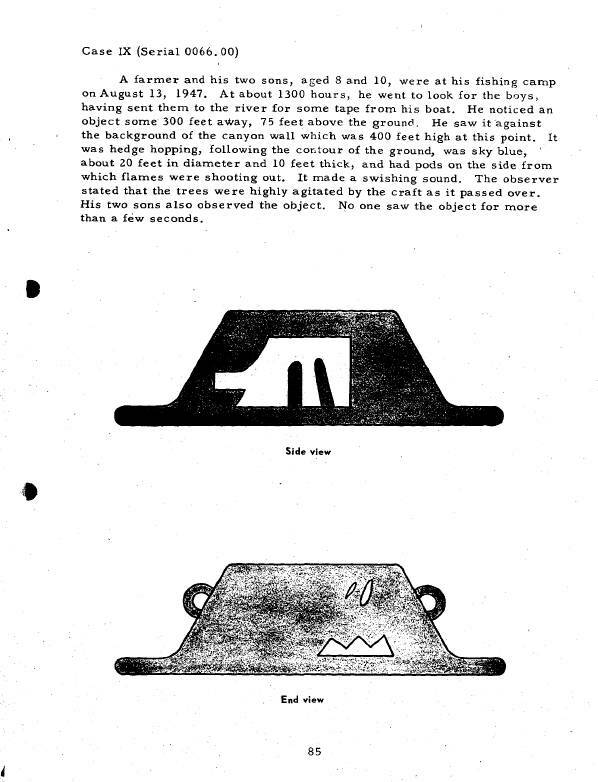 Hawkins related that while at Salmon dam Wednesday morning, a sound resembling that of an echo of a motor caused him to look upward, and there he saw to circular objects that reflected light. They were traveling at a great speed, and higher then most airplanes, according to Hawkins. Aside from this, he declined to add details, except to say, "there's something in the air." His general description however, corresponded closely to hundreds of persons who reported seeing "flying saucers" after Kenneth Arnold, Boise business man, touched a deluge by telling of coming upon nine disc-like objects while he was flying in his private plane in Washington. Thereafter the nation became increasingly "flying saucer" conscious creating a state of mind for four teen age Twin Falls boys to cause a mild sensation when they built a model flying disc and tossed in a local yard July 10th. This was subsequently revealed as a hoax, following the investigation by the army and the FBI. There after the saucer reports tapered off into a few scattered incidents until the question was revived by this weeks occurrences. Speculation has ranged from mention that the discs could be army navy guided missile experiments, or they could be experiments by some foreign country, to something out of this world. What ever they are, a lot of people have seen something. "...sent his boys to the (Salmon) river to get some rope from his boat. When he thought they were overdue he went outside to his tool shed to look for them. He noticed them about 300 feet away looking in the sky and he glanced up to see what he called the flying disc." This strange object was flying at high speed along the canyon which is about 400 feet deep and 1,200 feet across at that point. It was about seventy-five feet above the floor of the canyon (and so more than 300 feet below the edge of the canyon) and moving up and down as it flew. It seemed to be following the contours of the hilly ground beneath it. Urie, who said he was at about the same level as the UFO, so that he had a side view, estimated it was about twenty feet long, ten feet wide and ten feet high, with what appeared to be exhaust ports on the sides. It was almost hat shaped with a flat bottom and a dome on top. Its pale blue color made Urie think that it would be very difficult to see against the sky, although he had no trouble seeing it silhouetted against the opposite wall of the canyon. On each side there was a tubular shaped fiery glow, like some sort of exhaust. He said that when it went over trees they didn't sway back and forth, but rather the treetops twisted around, which suggests that the air under the object was being swirled into a vortex. He and his sons had an excellent view of the object for a few seconds before it disappeared over the trees about a mile away. He thought it was going 1,000 miles an hour. As the machine went by the Urie place, the trees over which it had almost directly passed (Mormon poplar) did not just bend with the wind as if a plane had gone by but in Urie's words, "spun around on top as if they were in a vacuum." Keith Urie, eight years of age, said he first saw the machine coming down the canyon, heading from east to west and following the contours of the ground. Billy, ten, saw it almost immediately. Both watched it fly out of sight behind a tree in a matter of moments. They said they ran to their father and learned that he too had seen the machine. Urie seemed completely sincere about the incident. He said his wife and daughter were in the house at the time and had not seen the machine. He questioned his brother, who also lives in the canyon, but his brother had been eating at the time and had seen nothing. Urie and his two boys maintained that they had never before seen one of the discs. Urie, when interviewed, appeared to be a sober, middle-aged man. John Brosman, the Times News reporter who originally furnished Special Agents with information about the incident, likewise stated that Urie appeared completely sincere about the machine. inasmuch, who at the time were fishing at Salmon Dam while and was supposed to have been working in Twin Falls. No further attempt was made to locate two other men who said they also repeatedly saw the object inasmuch as [blackened out name] was fishing at this time with [blackened out name] at Salmon Dam and [blackened out name] was supposed to be at his work at Twin Falls (*). (*) J. Allen Hynek added in 1977 his comment, "thus is Science frustrated of precious testimonies." It is clear that there is nothing astronomical in this incident. It must seemingly be classified with other notifications of a disc made in in good faith by observers. However, two points are of interest: the "sky blue" color and the fact that the trees "whirled as if they were in a vacuum." Is it possible that it was an atmospheric eddy affected by a fast travel rate? It seems logical to accept the deduction of Dr. Hynek for whom the object was simply an atmospheric eddy travelling at a high rate of speed. However, later in 1955, the conclusion given by Project Sign was revised by Project Blue Book and the case appears as underneath in the famous Special Report N.14, included among the "unknowns." A farmer and his two sons, aged 8 and 10, were at his fishing camp on August 13, 1947. At about 1300 hours, he went to look for the boys, having sent them to the river for some tape for his boat. He noticed an object some 300 feet away, 75 feet above the ground. He saw it against the background of the canyon which was 400 feet high at this point. It was edge hopping, following the contour of the ground, was sky blue, about 20 feet in diameter and 10 feet thick, and had pods on the side from which flames were shooting out. It made a swishing sound. The observer stated that the trees were highly agitated by the craft as it passed over. His two sons also observed the object. No one saw the object for more than a few seconds. The Air Force was obviously ready to admit the silliest explanation to dismiss a UFO sighting. Come to think that it is with such an obviously dimissive approach that Project Sign nevertheless conluded in their "estimate of the situation" thatm yes, flying saucers are for real, and yes, they are extraterrestrial. So much for the notion of naïve and gullible Air Force UFO enthusiasts: they were outrageously anti-saucers, but had to conclude that saucers exist nevertheless. Astronomer J. Allen Hynek has later rejected his own explanation. He explained that he had never heard of "atmospheric eddies" moving at 1000 mph. Needless to say that the witness description has nothing to do with atmospherics; they reported a "nuts and bolts" craft. He explained that in these early days of the investigations on the UFO phenomenon, the general idea at the Air Force and elsewhere was that flying saucers cannot exist, therefore they do not exist. Any explanation, however silly, was prefereable to a lack of explanation, or worse, to the conclusion that flying saucer existed and were, as the newspaper said in this case, "not of this world." Hynek, in his 1977 book, imagined how his evaluation should have been if it weren't for the abovementioned denial: "We must believe these witnesses, in particular because of the numerous reports of similar nature in the recent past. This is indeed an aircraft, produced by an intelligence way ahead of us. It is vital to start a full blown investigation immediately ...". He adds that he knew very well what would have happened if he had offered such a statement to the Air Force: he would have been dismissed, regarded as "one more saucerist crakpot." This sad state of affair at least shows that Dr Hynek was indeed more than skeptical as to the existence of flying saucers at the start. When he finally went public and admitted that saucers do exist and that the Air Force should have let it be known, it was not because he was a saucerist crackpot. As for the case itself, there can be only two alternative conclusions: either the main witness and his two sons lied convincingly enough, or they saw a flying saucer of extraterrestrial origin. "Heads Up, Folks! The Discs are Flying Again", newspaper article by John Brosnan, Times News, Twin Falls, Idaho, August 15, 1947. "Study NO. 102-EL-55/2-79, Analysis of Reports of Unidentified Flying Objects - Project NO 10073", aka "Blue Book Special Report N. 14", a study by the US Air Force, page 78, May 5, 1955. "Comprehensive Catalog of 1,500 Project BLUE BOOK UFO Unknowns", by Brad Sparks, 2003.